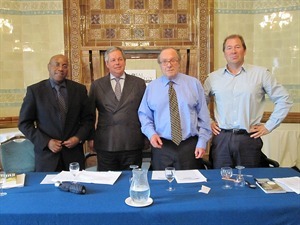 Tony Baldry MP, Dr Knox Chitiyo (Head of the Africa Programme at RUSI) and Dr Richard Cockett (Africa Editor at The Economist) took part in a GSF debate entitled ‘Africa: A Continent Whose ‘Time Has Come’?’ on Tuesday 13th July. The answer to the question was a qualified ‘yes’. Dr Knox Chitiyo felt that Africa had now become part of the international system and was no longer a passive player and therefore needed to ‘seize the moment’. Tony Baldry MP and Richard Cockett were more ambivalent. Richard Cockett, author of ‘Sudan: Darfur and the Failure of an African State’ spoke about the situation in Sudan and said it was a good example of all the negatives in Africa. Tony Baldry called for a new chapter to be opened in the narrative of development aid, both from the perspective of the donors and the recipicients, which focused on transparency and effective outcomes, particularly at a time when the UK public was sceptical of the ringfencing of international aid, a point which was reinforced by all three panellists. The audio transcript of the debate is available by clicking the link above.